SIGNS-N-FRAMES can help you get the exposure you need to win your political race. We offer many proven political sign templates and options and we can also help you establish a clear campaign message that is as unique as your candidacy. Design your own political sign or choose from our political templates that allow you to customize information like candidates name, associated websites, polling places and more. You can even upload your own political images or campaign logos to save you time! Whether you are promoting a candidate or a proposition, or need signage for your polling place, our custom political signs will help you get the job done. 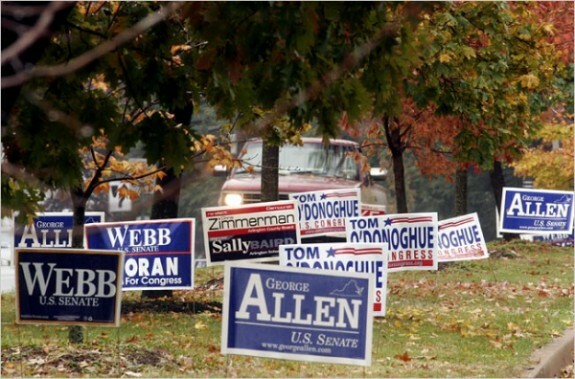 Our corrugated plastic, aluminum and magnetic campaign signs are made of the highest grade materials. Make your campaign count with our durable low-cost political signage! Stand out from the other campaigns with a custom political sign that sets you apart!